Kristin is your average 12-year old girl, concered about her weight, her looks and her friendships at a school were the academic competition is high and the popularity race is never ending. Walker made into the school through scholorships is trying hard to excel at a school where he is the only African American boy in his grade. As Walker and Kristin try to nagivate their lives through seventh grade, Kristin stumbles upon a secret that could change their lives forever. Fans of Gennifer Choldenki’s historical Al Capone books will appreciate this contemporary tale of 12 year-olds struggling with their identities at an upper class private school in San Francisco, CA. Each chapter is told through the perspective of either Kristin or Walker. Each child has their own set of insecurities, worries and confidences. At the beginning of seventh grade Kristin’s best friend just leaves her to go hang out with the popular yet mean girl crowd. Kristin struggles with weight issues which her parents only worsens with their constant battles at home. Only Walker is a stable and reliable anchor in her otherwise topsy-turvy life. Walker is struggling to do well in school while living with his single mother in the slums of San Francisco. Choldenko raises many issues in this book. 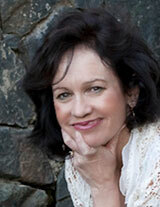 Issues on; body image, racism, prejudice and friendship. Her characters are not heroes, they are normal seventh graders trying to figure things out. The major themes of racism are subtle and eloquently paced throughout the book through the conversations and the actions of the kids, which most likely mirrors what they hear at home from their parents. Most kids will be drawn to Kristen and Walker as identifyable characters. Kristin has her flaws, but is a good person with a big heart. Walker is smart, level-headed and is trying hard to succeed in a very white world. 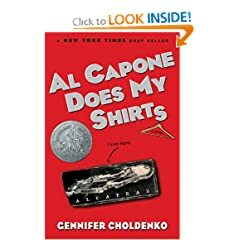 In the sequel to Gennifer Choldenko’s New York Time’s Bestseller, Al Capone Does My Shirts, (you can read my review here), Al Capone Shines My Shoes takes the book to a whole new and exciting level. Now that Natalie Flannagan is safe and sound at the Esther P. Marinoff School, Moose can finally start to live a normal life, hanging out with his parents and friends without having to constantly worry about taking care of his autistic older sister. Just as Moose’s life seems to be on the verge of greatness, he finds a note in his laundered clothes from the most dangerous criminal, Al Capone. The cryptic message says only “your turn, then we’re square.” This single note soon sends Moose down a tailspin of events as he tries to deal with girls, friends , family and Al Capone. As much as I loved the first book, this one is about 10x better. The characters are better developed, and the story line is much more exciting now that Moose is indebted to Al Capone, and along with the troublesome Piper, there is also Darby Trixle, whose main purpose is to make Moose’s life as cumbersome as possible. While this is still a book about youth living on Alcatraz Island during the 1930s, it is more of a book about friendship, honesty and trust. Moose goes through a lot of trouble in order to learn the tough lessons that being honest is the best away to avoid major problems. We do finally see a softer side of Piper, although I really don’t understand why Moose has such a crush on her. Moose’s devotion to keeping Natalie at the boarding school is of such high importance that he’ll go through anything to make sure she is safe and happy. This book is ideal for the 5th to 8th grade range, covering history, politics, social commentary and most of the personal and emotional behaviors that children that age deal with regularly. The writing is witty, sharp and historically accurate, including historical trivia at the back (my favorite part!). If you loved Al Capone Does My Shirts, then this book should be next on your list. Don’t miss your chance to win a copy of this book! Sign up here to enter my Its my Birthday, Book Giveaway contest running all this month. Sign-up here and look for this week’s drawing! This 2005 Newberry Winner has definitely been on the radar of great children’s books for a while. I picked it up during one of my quieter shifts at the library and have been reading it pretty steadily. Al Capone Does My Shirts, by Genniger Choldenko tells the story of Moose Flanagan and his family as they move from Southern California to Alcatraz Island, circa 1935. Al Capone is the big fish in the prison cell along with Roy Gardner and Machine Gun Kelly, and Moose’s dad is now working double duty as a prison guard and technician. But, living on the same island as the nation’s worst criminals is not Moose’s biggest problem. He’s the younger brother of an autistic sister, Natalie, who is constantly under his watch and care. There is also Piper Williams, the warden’s daughter. Between looking out for his sister and struggling to make friends and find a sense of normalcy in his life, Moose has his hands full. What I like about this book is that the kids are very much real. They are the kids at 12-13 years old, struggling to make friends, and be cool. Piper is full of get-rich schemes, from charging the students at their school 5 cents per clothing item to be hand-washed by criminals, or sneaking onto a ferry that also holds Al Capone’s mom coming in for a visit. Baseball is a big part of Moose’s life on and away from the island, and one of the favorite passtimes of the island kids is to try to catch stray home-run balls hit by the convicts. Moose has it hard on the island, with his older sister getting all the attention. He is an attentive and brave younger brother for constantly putting his sister’s needs before his own. The tight and loyal relationship between Moose and his sister is beautifully written. We can see Moose’s heartbreak at his sister’s faults, but also his love for her. Moose is a very honest and lovable narrator, giving careful details of his ordeals and emotions trying to juggle all the facets of his life. This book is a fantastic historical fiction peice that I would reccommend to any 9-10 year old wanting a glimpse in San Francisco’s past. I would even offer this book up for adults, as the themes of family and identity are very rich.